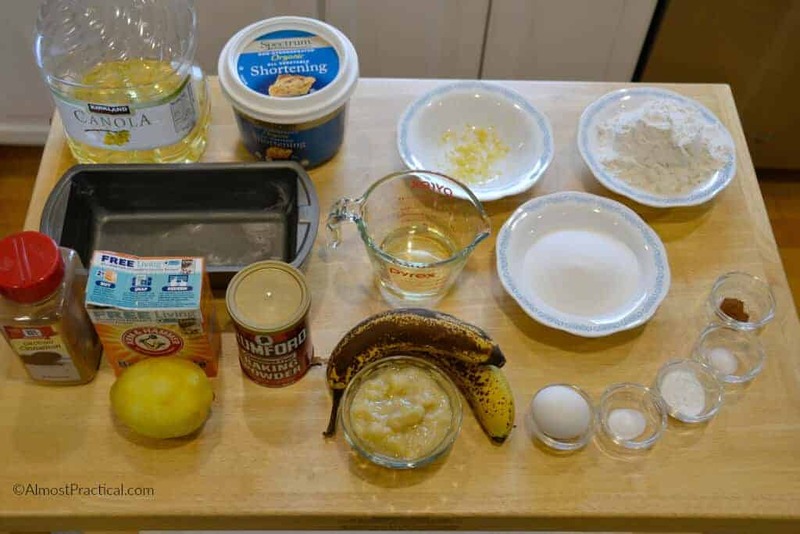 This is my family's favorite Banana Bread Recipe. It comes out amazing just about every time – so I thought that I would share it with you. A bonus is that it is really easy and it doesn't take long to make. The first thing that I did was pull together all of the ingredients to make this banana bread recipe. Then, in a large mixing bowl, I stir together all the dry stuff (except the sugar – which goes with the wet stuff – even though it isn't wet). So I mix the flour, the baking powder, the baking soda, cinnamon, and salt – and then I set this aside. In a smaller mixing bowl I now combine the wet ingredients. This includes the egg, oil, mashed banana (learn how to mash bananas here), lemon zest and the sugar. Next, pour the wet ingredient mixture into the flour mixture all at once. Remember – don't over-mix and do NOT use a mixer. Just stir it by hand. It's easier and you won't have to wash any beaters. Pour the batter into the greased bread pan and spread it around evenly. Finally, bake the banana bread for about 45 minutes. When the bread is golden brown and you tap the top and it sounds sort of hollow – then the bread is done. You can also stick a knife in the center to make sure it comes out clean. 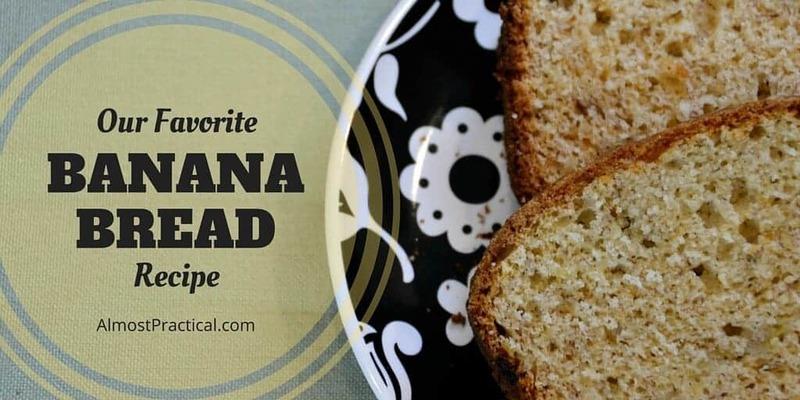 You can get creative with this Banana Bread recipe and make it your own. In the picture above, the loaf in the back was in the oven for about 5 minutes more than the loaf in the front. You can see that the crust is thicker and browner. You can adjust the baking time depending on how crusty you like your banana bread. I put 3/4 cup in the banana bread that I made today – but I feel like it is just a tad too sweet. Yet half a cup would not be enough. So usually I put in a “scant” 3/4 cup of sugar – meaning that I put in slightly less sugar. I get it – there are not always fresh lemons in the fridge. You could just omit it – but I like the tang that a little lemon adds to this banana bread recipe. So, if you don't have fresh lemons you could add 1/8 of a teaspoon of lemon extract instead. Or a tablespoon of bottled lemon juice just might do the trick. I kept this banana bread recipe simple and only threw a little cinnamon for flavor. But you could experiment with other spices that you like. A quarter teaspoon of nutmeg gives it a holiday feel. Or a half teaspoon of vanilla makes it taste more like cake. The possibilities are up to you. Ok – I'm saving the best for last. Just for kicks, we created a COOKING VIDEO to illustrate this banana bread recipe. It turns out that my daughter has a natural talent for producing and editing video – who knew? 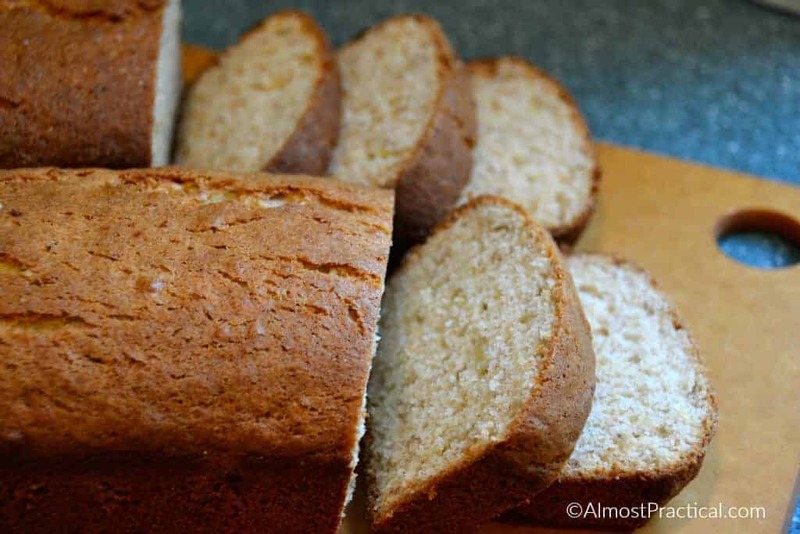 Our favorite banana bread recipe - moist, delicious, and easy to make. Then, in a large mixing bowl, I stir together all the dry stuff (except the sugar – which goes with the wet stuff – even though it isn’t wet). Remember – don’t over-mix and do NOT use a mixer. Just stir it by hand. It’s easier and you won’t have to wash any beaters. If you are looking for a good recipe or if you have any questions about this post – please leave comment below. 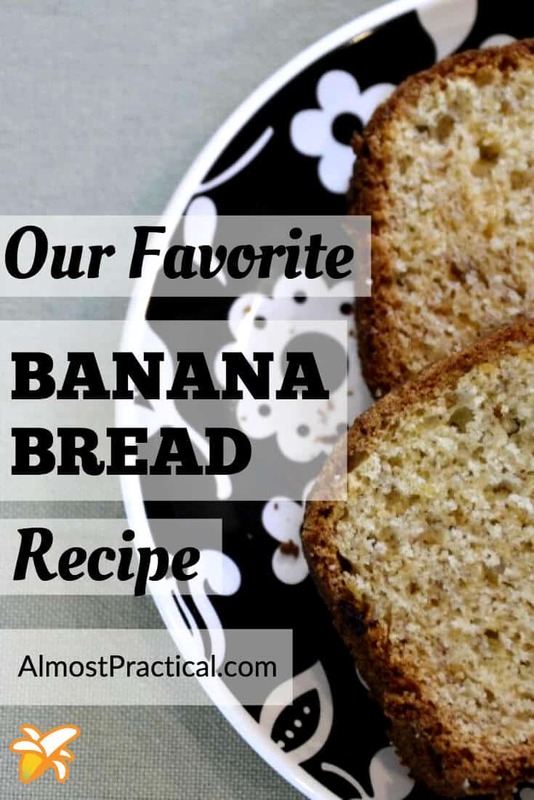 And if you tried this banana bread recipe then I want to know about it! View all recipes on Almost Practical here.